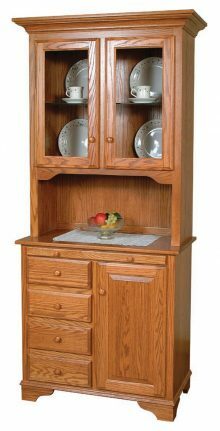 A solid wood Amish bread box hutch from AmishOutletStore.com can provide that “missing ingredient” to your home’s dining room décor! 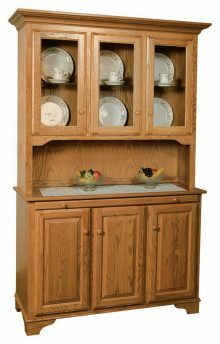 While our dining room hutches come in a wide assortment of sizes, designs and styles, they all have one thing in common: superior Amish craftsmanship that ensures your hutch will remain a cherished family heirloom for generations. 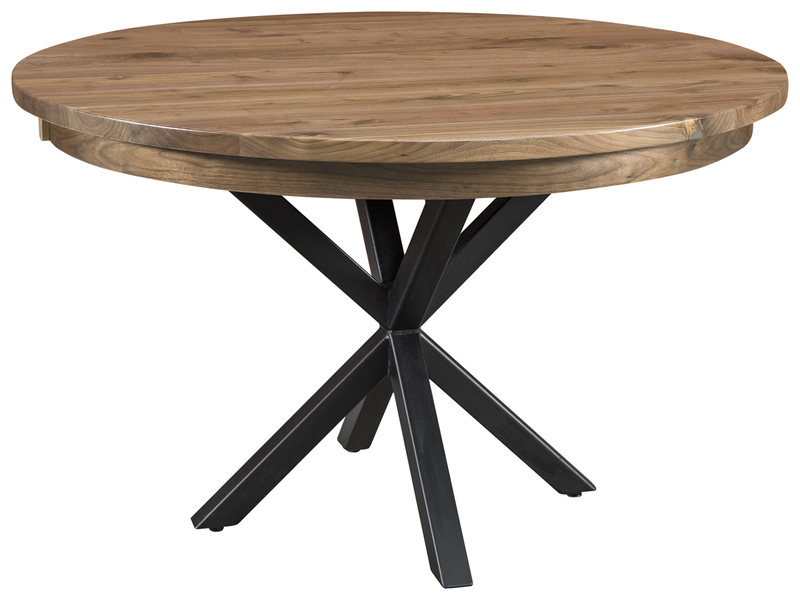 An array of hardwood options that includes Oak, Cherry, Maple and others, as well as a choice of numerous stain options, allow you to customize the piece to your precise specifications. We offer an extensive selection of solid wood bread box hutches to suit any room. 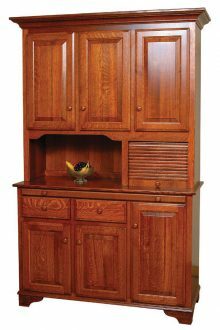 Whether your space is big or small, bright or dark, traditional or country-style, you can find a hutch that will look stunning. Still, it can be hard to narrow down your options when they’re all so appealing! 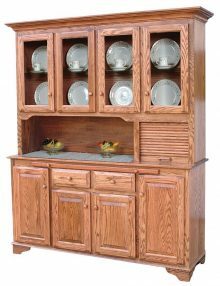 Width: If you have a smaller room, you’ll want a narrower hutch, such as our Two-Door Bread Box Hutch. This will take up less room than a four-door version. 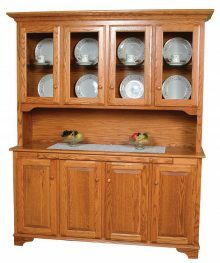 Display space: You may want to display your wedding china or family knickknacks in your new bread box hutch. If so, find an option that has glass cabinets on top, such as the 54” Bread Box Hutch w/ Center Opening or the Four-Door Bread Box Hutch. Storage area: Many people buy bread box hutches so they can store dishes, glasses or napkins inside. 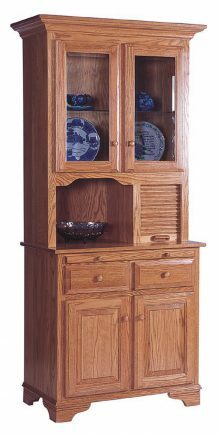 Make sure you buy a hutch that has sufficient storage space to fit everything you want in the drawers and cabinets. In the display area of your new hutch, highlight items that complement your existing décor around the room, such as candle holders made from the same crystal as the vase on the table, or plates with the same pattern as ones displayed on the wall. Runners are a great way to pull your new hutch into the room’s color scheme. Pick one that has some personality, instead of playing it safe with a solid color. Add pizzazz and tie the hutch into the rest of the room. All of our hutches match other furniture made by AmishOutletStore.com, offering you a chance at a cohesive look that will carry throughout the room. 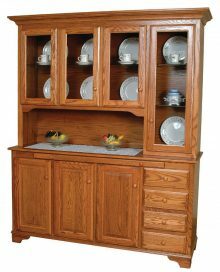 Consider buying matching furniture, such as a new dining set or kitchen table, that will look perfect alongside your new hutch. When you buy a new piece of furniture, you want to know it will last. You need to use this new furniture every day, and you don’t want to deal with any unexpected problems. Our furniture has been constructed from the finest materials to ensure a long life. 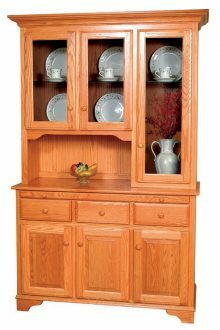 You can take things in and out of the drawers, lay dishes on the top, and clean the hutch daily without worrying about long-term wear and tear. Our bread box hutches also include numerous user-friendly features such as adjustable shelves, cutting boards, dovetailed drawers and much more. This means our hutches are not only attractive, but they’re also highly functional furniture pieces that bring significant value to your home. Get to know each of our fabulous Amish bread box hutches by reviewing the individual product descriptions found on this page.